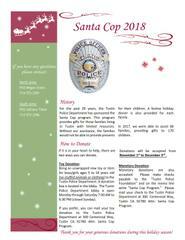 For the past 29 years the Tustin Police Department has sponsored the Santa Cop program. This program provides gifts for those families living in Tustin with limited resources. Without our assistance the families would not be able to provide presents for their children. A festive holiday dinner is also provided for each family. In 2017, we were able to assist 68 families, providing gifts to 170 children. If it is in your heart to help, there are two ways you can donate. Bring an unwrapped new toy or item for boys/girls ages 5 to 18 years old (no stuffed animals or clothing) to the Tustin Police Department. A donation box is located in the lobby. The Tustin Police Department lobby is open Monday through Saturday 7:00 AM to 6:30 PM (closed Sunday). If you prefer, you can mail your toy donation to the Tustin Police Department at 300 Centennial Way, Tustin CA 92780 Attn: Santa Cop Program. Monetary donations are also accepted. Please make checks payable to the “Tustin Police Foundation” and on the memo line write “Santa Cop Program.” Please mail your check to the Tustin Police Department at 300 Centennial Way, Tustin CA 92780 Attn: Santa Cop Program. Donations will be accepted from November 1st to December 3rd.